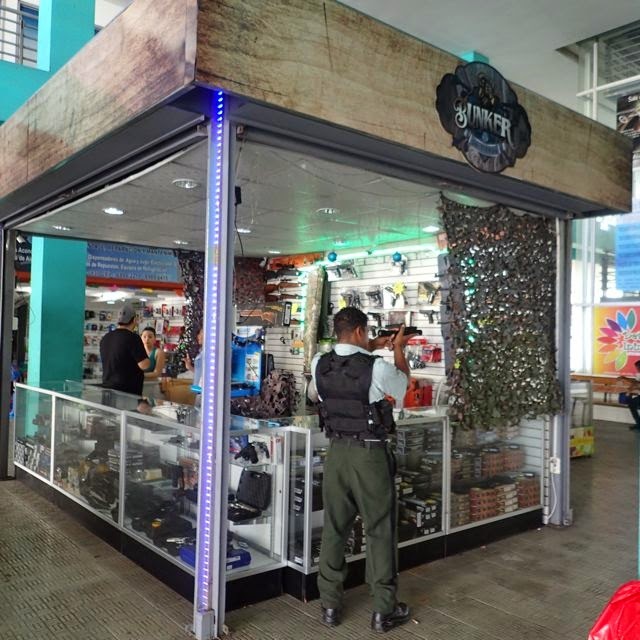 Weapons kiosk at mall in Colon Panama. Nothing like carrying nearly $2,000 cash around Colon, PANAMA, a place reputed to be totally unsafe to get your adrenaline going! That's what it cost to prepay for a small sailboat to go through the Panama Canal, though about $800 should be returned not long after, as it's just a damage deposit. Fortunately, we managed to get our money safely deposited at the one bank in Colon the Panama canal requires. 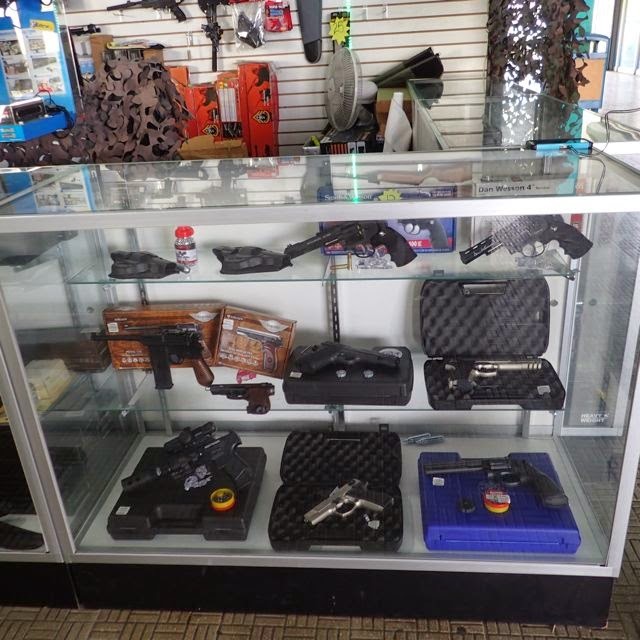 Closer look at the selection at Colon's weaponry mall kiosk. We passed by many neighborhoods of gated communities surrounded by 8' fences topped with either electric fences, barbed wire or both. Most shopping centers and certainly all banks are prominently staffed with armed guards. 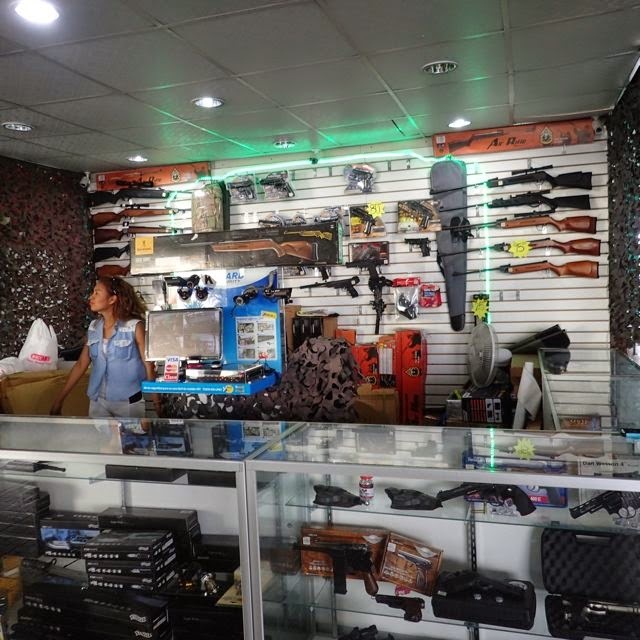 Mall kiosks alongside Subway and Happy Fashion phone accessories included a kiosk that sold rifles, handguns, scopes and knives. A closer look at the gun kiosk's selection. This post was prescheduled the night before we began our two day journey through the Panama Canal on the hunch we won't have internet access along the way. We'll be through and in the Pacific February 14 - Valentine's Day - 2015. It was written at anchor just outside Colon's Club Nautico (N09.21.885 W79.53.563), near the Atlantic/Caribbean Panama canal entrance. Most likely we'll be at Gatun Lakes when this posts Friday eve, at (N09.27.215 W79.92.266).